While most people are busy with the World Cup, the EU and Indonesia are having their 5th round of negotiations for a dangerous new deep and comprehensive trade agreement. 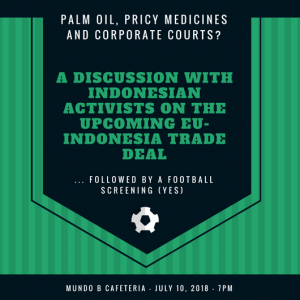 On the evening of July 10, Indonesian colleagues will share their experience and struggles from Indonesia, and how the EU-Indonesia trade agreement threatens to undermine them. The informal exchange will cover topics of interest for people in the room, including palm oil and deforestation, labour struggles in Indonesia, new rules restricting access to medicines, and the Indonesian experience with arbitration tribunals (and getting rid of them). .. and the World Cup semi finals will be screened from 8pm on. Discussions on the EU-Indonesia agreement will continue in parallel. A limited amount of food and drinks will be available – please RSVP below.